On Saturday, March 4, the Nevada desert will be lit up with the madness of more than 300 off-road vehicles racing in one of the most famous events in motorsports: the Mint 400. 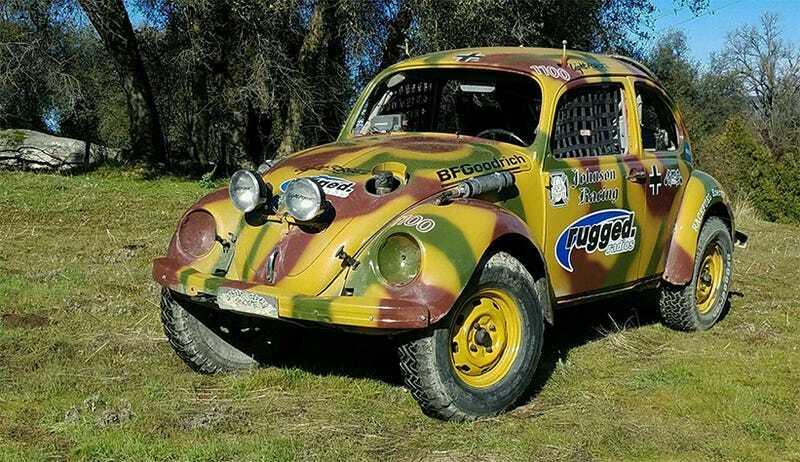 This ratty old Volkswagen should be enough to keep up, right? We peeped the race last year in a $240,000 Mercedes G-Wagon as spectators. This time, I’m suiting up and diving off the deep end in a car I’ve been told “will treat [my] kidneys like maracas.” A “Class 11” car also known as a stock Beetle. For those of you who aren’t into the off-road racing scene, the Mint 400 is the same event Hunter S. Thompson was famously “covering” in Fear And Loathing In Las Vegas under different ownership. Now that’s how an ad for a truck race is supposed to sound! If you can’t make it to Nevada you can chase the race remotely with live tracking and a live leaderboard. But keep an eye on social media (#mint400) too, including YouTube and Facebook for rapidly updated action vids. I’ll be in car 4701 for a lap, as long as I get up early enough to make last call for registration. Like most desert races, the Mint welcomes a huge range of vehicle types from dinky little barely-modified VW Bugs to full-on factory-supported trophy trucks that can rip at over 100 mph. The Beetles start bright and early at 6 a.m. on Saturday to minimize their odds of being pancaked by faster vehicles which kick off at half past noon. Everybody who’s into cars but doesn’t know much about off-road thinks the desert racer vintage VW is the coolest thing ever. Everybody who’s part of the scene says I’d be crazy to climb into one. So I figured we’d better experience this for ourselves. Beetle racer Robert Johnson was willing to take me under his wing as his co-driver for one of his team’s two massive laps, and if you’d been reading this on March 3, 2017, I was probably puttering across the California/Nevada border on my way to meet my destiny. Wish us luck. And life. Why Eat Sand When You Can See The Best Mint 400 Moments Right Here?